"Marvel cinematic universe official tie-in"--Cover. 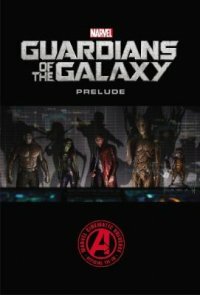 Contains material originally published in magazine form as Marvel's Guardians of the Galaxy Prelude #1-2, Marvel's Guardians of the Galaxy Infinite Comic #1, Iron Man #55, Strange Tales #181, Incredible Hulk #271; Tales to Astonish #13, and Guardians of the Galaxy #0. "Who is Nebula? What tragic events forged her unbreakable allegiance to her dark lord? And how does Korath the Pursuer fit in? Then, as Gamora begins her quest for the Orb, see firsthand why she is the considered the most dangerous woman in the universe! Plus, relive the Guardians' individual debuts as Gamora and Star-Lord burst onto the scene, Drax and Iron Man take on Thanos, Rocket Raccoon meets the Hulk...and Groot tries to enslave the earth!"--P. of cover. Guardians of the Galaxy (Motion picture).